Among the hectic lifestyle and stress, we thought that these memorization tips would be helpful for children to improve their memory. Something they can work on during their free time. Not only does it help with memory work for facts and figures, but it also helps to reduce the chances of one of the most feared scenarios – when a child’s mind goes blank. Therefore, we are giving you these 5 tips and tricks. We hope that they will make good use of them during their learning. 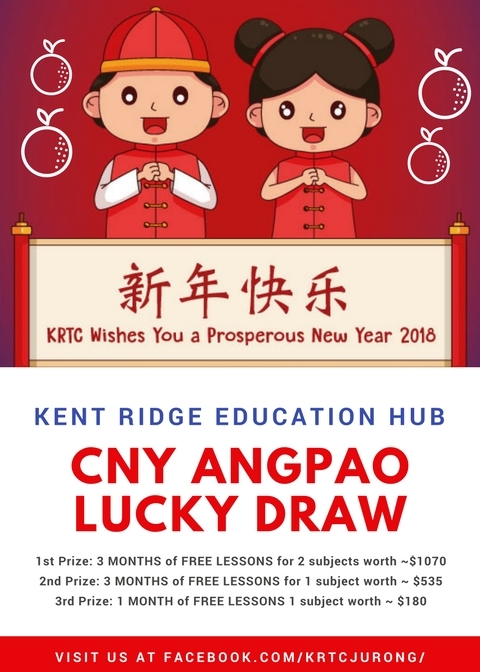 We here at Kent Ridge Education Hub hope that these will be beneficial to the students. Memory performance tends to decrease when we try to memorise large chunks of data or information. This make it worst if we do not have a strong interest in the subject or if the information is very dry. One way we can overcome this obstacle is to break the information into smaller parts and to create a story to link all these parts together. The story can be entirely imaginative and out of the world, but if it helps you to remember, then it is a good story! This can be an interesting tip. By taking a walk before our examination helps us to boost memory and brain power! In an experiment that is being carried out, students taking the same exam were asked to either sit quietly or go for a walk. Surprisingly, those who went for a walk did better and brain imaging showed a higher amount of brain activity. Now you know what to do before an examination! Most students tend to read their textbooks silently and pray for the information to be stored in their memory. According to the Ebbinghaus Forgetting Curve, almost 40% of the information that we have just learned get forgotten merely after 20 minutes. This is how scary it is. Thus, one way that students can do to help increase the rate of retention would be to verbalize the content out while they are studying. This also helps to keep them more alert and focused, instead of day-dreaming or dozing off! There is a reason why mind maps are so popular and in fact they do work! By drawing a mind map, you can make the connections between seemingly different concepts clearer. This also serves as a handy revision tool as you get a whole visual overview of the chapter just by looking at your mind map! Other than that, it is easier to memorize from a mind map as compared to the content in your textbook. Lastly, the retention would be higher as well because you would have a mini revision when doing up the mind map, so it is a win-win situation! Many children tend to underestimate the ability of mnemonics. Mnemonic is a method that transforms large amount of information into an alternative form that makes it easier for one to remember. The list of facts would generally be in a certain order and it can be in the form of a song, acronym, image, or a phrase. A useful tip when thinking of mnemonics would be that the funnier or more absurd the mnemonics, the easier to remember! We hope these tips could help your kids memorize better! With 2 more months left till O levels, we know that many of you are trying to ramp up any studying sessions that you have currently. Some of you have been studying at a constant pace, while there are many who are still struggling with basic concepts or doing some last minute cramming. No matter if you are somebody who is confident about facing O levels yet or are internally panicking as you read this, here are some tips for you to DO RIGHT NOW to prepare for the O levels. The process of planning a timetable helps you to realise the amount of work you have to complete each day to be prepared for the big day. Without a timetable, it is very easy for you to procrastinate and you will tend to push your work till a later date as you will believe that there is still time. Furthermore, a timetable helps you to study multiple subjects in a day and to ensure that you have sufficient breaks in between studying to maintain maximum efficiency, which are two factors students tend to neglect. Many tend to just focus on one subject per day, but it is actually easier for your brain to absorb and memorize information if they are of different subjects. There is also no point having a straight 14 hours study marathon if your brain is already saturated midway and you’re not focusing at all. So do remember that breaks are there to help you and not to waste your time. It is common knowledge that exam questions over the years tend to be quite similar with a few surprises. Examiners always like to test on the same concept with just a different phrasing of the question. Since there are 2 months left only, you should definitely be practising your TYS right now. This is because doing it once is not sufficient at all. You should aim to redo the book at least 3 times. Many students protest about this, as they felt that their knowledge level is still not adequate to be attempting the questions. However, by the time these students feel confident enough, there is simply not enough time left anymore. Hence, even if you feel unprepared, just attempt the questions and understand the steps behind the solution. It is also more efficient to do so as TYS are usually organized by chapters, and thus, you can get a clearer idea of what you need more conceptual understanding or practice in. Cheat sheets are useful for both everyday uses and for just before the exam. Ever become frustrated because you have seen the question for the fourth time but you still cannot remember the formula to solve that question? This is exactly where cheat sheets can come in. Throughout your current study period, write down any formulas or definitions you find hard to remember on a piece of paper that is called your cheat sheet. This way, you can always spend a short 10-15 minutes a day reading through this sheet of paper and as time goes, they will be ingrained into your memories. This is also relevant for questions that you kept getting it wrong. Hence, you can refer to all of these just before the exam as well to remind yourself of the common mistakes you tend to make and the concepts you tend to forget. If you know that you have many morning exams, please do not cultivate a sleeping pattern of waking up at 12/1 pm daily. Research has already proven that performance is improved if you studied at the same period of time as your actual examinations. If you want to enjoy this benefit, do start this habit early as there will not be much effect if you just do it one day before the exam. Also, do you know that humans sleep better in blocks of 3? This is why you might feel more refreshed after a 3 hours nap as compared to a solid 8 hours of sleep. This is because our sleep cycle spans for around 3 hours starting and ending with light sleep with deep sleep in the middle. Wake up in the middle of your deep sleep and you’ll feel extremely lethargic. That is why you should use a sleep calculator (many available on the internet!) to calculate the most optimum time for you to wake up based on the time you’re sleeping at. It might be useful for you to join a crash course where you can consolidate your knowledge, identify your weak topics, and learn how to answer exam questions in the shortest amount of time. Crash courses, even though intense, are very effective ways to get you up to speed. These classes usually focus on popular exam questions and their solutions, common misunderstanding of concepts, examination tips, and sometimes even provide predictions of O levels questions. You can see why they are so popular nowadays. So do join one if you feel that you need an extra boost. Bring out your flair in writing. 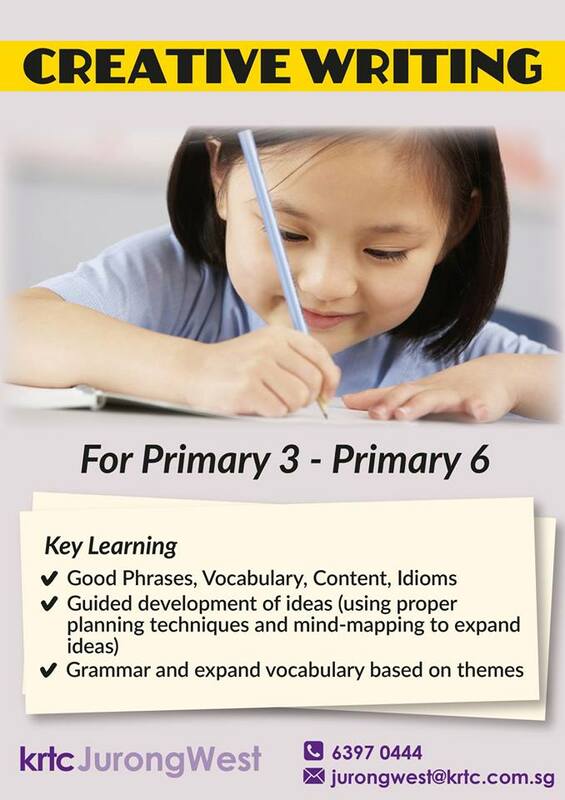 Creative Writing Classes For Primary 3 to 6. Course Name : Thematic Learning in Blocks of 10 Lessons. Starting Date : Starting in June 2018. All lessons will carry on as usual from 20 February 2018 (Tue) onward. For any enquiry or course registration, please feel free to call us @ 6397 0444 or email us at jurongwest(at)krtc.com.sg. we wish you and your family a Prosperous Chinese New Year! KRTC Jurong would like to take this opportunity to wish you and your family a Happy Chinese New Year. Hope the new year brings the greatest share of happiness, good fortune, prosperity, productivity and success! Each entry will entitle you to the latest 2017 Top Schools Mathematics Examination Papers for FREE! Or a FREE TRIAL LESSON of any subject and level of your choice. KRTC reserve the rights to amend the terms & conditions without any prior notification. Everyone would have experienced education stress at some point in their academic life. The positives and negatives of education stress has been a widely debated topic. Differing cultures have differing views about how impactable should education stress be on students today; how healthy it is for students and to what extend should education stress be manageable before others should intervene to help the student cope with the stress. 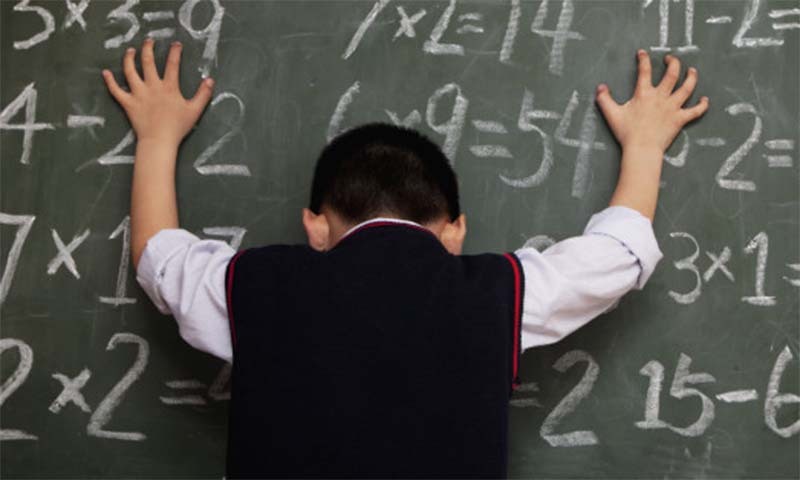 Singapore’s education system may be topping the charts all over the world, but it is putting a lot of academic and education stress on its students. Education stress has been a huge debate as to its impact on a student’s academic performance. Education stress has been proved to be one of the motivational forces that drives Singapore’s students to academic excellence. Research has shown that stress at appropriate levels can be a motivating force that energises us for the challenges we face. However, having overly high achievement motivation is also correlated with anxiety levels. Students should be highly motivated to learn and achieve, however, it must not come at the expense of their mental, emotional and physical wellbeing. Research have shown that high levels of stress can lead students to doing unfavourable and illegal activities such as glue sniffing, drugs, and even cause bodily harm to themselves as a form of distraction from their school work. In 2016, the suicide rate among 10- to 19-year-olds doubled from 2014, reaching a 15-year high. In 2015, 50 teens reported self-harming, an increase from 44 in 2014. Stress may affect a student’s health and their academic performance. Hence, coping strategies are specific efforts designed to help individuals better cope with stress and the anxiety that comes with it. Examples of coping strategies are slow breathing, mental vacations and doing a relaxing hobby such as reading a book or painting. Different individuals have their own subjective way to cope with stress. Thus, finding the suitable mode of relaxation for yourself would come in handy in stressful situations. 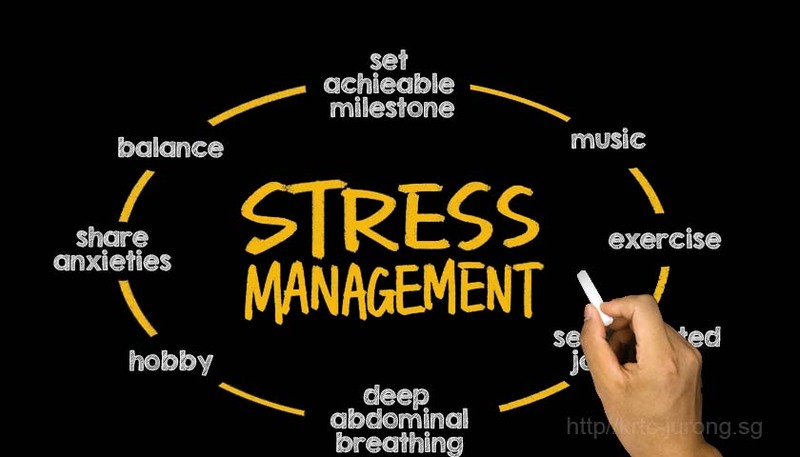 Stress and anxiety is a personal response that comes from one’s expectations, the expectations of the people around them and their ability to manage challenges. Hence, having a wider perspective of the education system, managing one’s expectations and looking beyond one’s, achievement can help students manage and cope with stress. Developing an understanding of one’s strength and weaknesses. Having bite size goals and short-term milestones can help in coping with anxiety. These bite size goals also help students keep track of their path to success. Such that if they miss their final target, they can still take pride in the overall achievement and journey that had embarked on. All in all, education stress has its positives and its negatives. While its positives can pose as a motivation for students, its negatives can affect students’ mental, emotional and physical health. Having a knowledge of some coping strategies will help in time of stress and anxiety. The Primary School Leaving Examinations, PSLE results has released. Our students have maintained 100% success rate to promote to secondary, and our 12 students score above T-Score of 235. Congratulations. Kudos to you for passing this important exam. I hope your result motivates you to pass every challenge that life throws at you. This exam may not be the biggest test of your life. But by passing with good grades, you have proved that you are ready to take on life’s bigger tests. Do note that exams and grades are temporary, but education is permanent. How is the media beneficial in educating a child? With the advancement in technology, individuals tend to use search engines in the hope to gain more knowledge as well as to get rid of the lingering unknown issue. In the 21st century, media literacy has become one of the essential skills. Parents are often highly concern when it comes to the usage of the media in education, most parents think negatively against the combination of education and the media but, how exactly does the use of media in education benefit a child? In this article, I would be mentioning about the benefits and downsides. Most educators face the issue of students not paying full attention, fidgeting and even going to the toilet as an excuse to leave the class. The use of media enhances teaching and learning that complements the traditional way of teaching. With the usage of the media, students are highly motivated and engaged leading to a better retention of knowledge. Active learning strategies like case studies and group discussions could be a component of the media. The media could be a song that’s being played on the radio, a film clip, a podcast or even a newspaper article. The media appeals to a variety of different learning styles be it visual, auditory and kinesthetic therefore making it a beneficial learning experience for each and every student. Critical thinking skills could be developed as educators could use the media to probe students with questions that facilitate discussions that exceeds beyond fundamental questions. The media also influence students more than anyone else. With the usage of favored customary mediums, students, as well as educators, benefit from it such that the media capture the attention of students enabling them to maintain their interest in the concepts and theories being discussed during lessons. Media sources offer the experiences of both cognitive and affective and could evoke students to discuss on the evaluation on oneself likewise their values. Media sources tend to have high production quality and are able to showcase complex ideas within a short period of time, this helps in the development of quantitative reasoning. Students are enabled to view concepts and examples while they watch television or are at the movies with their peers. Through the media, students are able to experience a world beyond their very own as the media might portray a different environment. An increase in the ability and proficiency of students in communication through expressing and disseminating of their thoughts and ideas within a massive range of traditional and new media forms. Students would focus on process skills rather than content knowledge and would benefit from it to be empowered to live in a media-saturated culture. Real-life happenings on media interconnect with students through an authentic experience in learning such that students are able to visualize the connection between what they learn in school and how such knowledge could be used as a member in the society. It enhances the engagement of students. Younger children benefit from it by the adoption of different skills sets namely – literacy skills, numeracy skills and social skills. While adolescent could gain developmental benefits of the media that are intellectual, educational, social and creative. Adolescents spend a whole lot of time on new media causing the increasing concern in regards with this issue. The mass media influences the behaviors of an individual… most concerns revolve around the effects of the media where violence, crimes, sexual relationships, drugs, smoking, alcohol abuse, body image, diet, obesity and preference in food are being protrayed. Adoleescents are unable to know the right from the wrong and might pick up the wrong behaviors. As answers are often found on search engines, students rely on the internet in the accessibility of information causing the reduction on the focus on learning as well as retaining information. Students may also spend lesser time in socialising due to the lack of nonverbal cues – tone and inflection and body languages causing the effectiveness of an individual in communication to arise. The media has yet to be able to be an adequate replacement for face-to-face social interaction. All in all, an individual who is media literate is able to have access, be able to analyze and evaluate information received from the media and in turn be able to think critically and be a confident speaker. Our intensive holiday phonics programme is back!! ‘Read in a Week’ Phonics programme has been around Singapore for the past 17 years, and many children have benefited from it. KRTC/ Power Phonics & Literacy reserve the rights to amend the terms & conditions without any prior notification. The Jun intensive holiday phonics programme is back!! ‘Read in a Week’ Phonics programme has been around for the past 16 years, and thousands of children have benefited from it.